It's a lot of fun attending an animal show at your favorite theme park, but did you know you might be missing out on some wonderful opportunities to get a little closer and have a more personal encounter with the performers? Professional animal trainer and behaviorist Dan Stockdale offers some insider tips that can help you make the most of your experience. The first thing you'll want to consider is when is the best time of day to attend the show. When are the animals the freshest? When are they likely to be their most cooperative and put on the best show? According to Dan Stockdale, who has been performing with the Wings of America show at Dollywood amusement park since 2008, "The second or third performance of the day is usually the best time to see the show because they have the largest crowds and generally also have the most energy. The animals are always fresh and invariably perform well. They are professionals, and they respond well to cues almost every show. However, the first and last shows of the day can also be very nice if you prefer slightly smaller crowds, although on peak days, every show will be packed." Stockdale also recommends arriving early if you want to get the best seats. Shows often wind up with standing room only on the busiest days. So, which seats are really the best in the house? Sitting down in front certainly gives you the closest, unencumbered view of the show, but sitting up higher does offer a broader view of everything going on. Stockdale advises people attending the Wings of America show to try to find seats about three to four rows back from the front in the middle section. "You will be in the direct line of flight for birds flying during the show, and you will also have a great camera angle for some very memorable photos. Just listen to the show hosts and be quick with your camera. During certain segments of the show, things happen very quickly." You're bound to have a good time just watching the show like everyone else, but what if you're hoping for a little more? Perhaps you'd like to ask the trainers and performers questions or maybe even see some of the animals close up. Maybe you'd even like to take some photos of the animals. There are some tips for these aspects, as well. Stockdale recommends approaching the stage immediately after the show. "We always stay on stage after the show until the last person is finished asking questions. Also, if you want to be a volunteer on stage for the next show, just ask! If you are the only one who asks in advance, and you sit close to the front where we can see you, you're likely to be selected. Of course, be sure to raise your hand when we ask for a volunteer so you are easy to spot! As a volunteer in the Wings of America show, you will get a very up-close and personal encounter with a black vulture as he lands on your left arm. But don't worry - we put a shoulder-length leather glove on your arm so you won't get injured." Of course, many attendees love taking photos. You'll probably find that some shows have a few restrictions on what you can do while others don't. Stockdale says that photos are always allowed during his show, and flash photography doesn't bother the birds. "During the show, be sure you have a camera with a good zoom lens. You don't need an expensive camera with a fancy lens - just a good camera with a good lens. You will get some great photos. After the show you have the opportunity to come right up to the stage. You will be within just a few feet of the bald eagle, America's living symbol of freedom. Take pictures and you will have memories you will cherish for a lifetime! 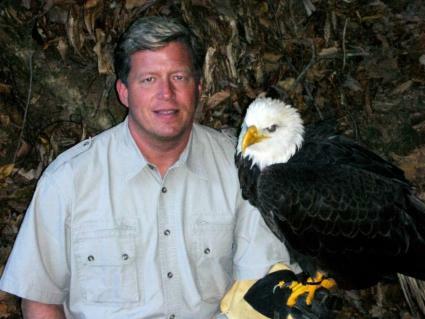 According to Stockdale, only a small percentage of audiences take the time to come up after his show, and he believes these guests experience the most memorable part - the opportunity to experience an eagle so close they can feel the wind from its wings as it moves. He says, "Once you look into the bird's eyes, you will know exactly where the term 'eagle eye' originates. An eagle's gaze is amazingly intense!" 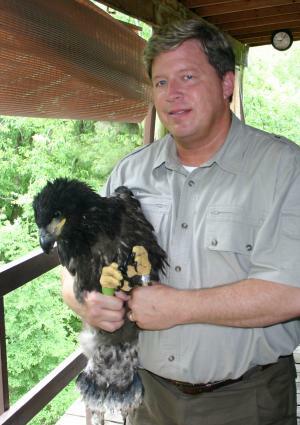 Speaking to the conservation element that's central to the show, Stockdale adds, "We also have nesting pairs of eagles in the aviary beside the theater, known as Eagle Mountain Sanctuary. Bring a camera with a long zoom lens for these pictures since the eagles can easily be 50 to 100 feet away. You will get great photos of these magnificent birds in a very natural environment. Stockdale also recommends checking out the Eagle Nest Cam from early spring through summer at Eagles.org. Visitors can watch live as mom and dad sit on their eggs, watch the eggs as they hatch, and then watch the young eaglets as they grow. The eaglets are then released into the wild to replenish the wild population!" Getting a look behind the scenes would be a dream come true for many audience members, but how many people actually ask? According to Stockdale, "Backstage tours can usually be arranged by calling the park's main office. People who are generally interested in going backstage are typically school groups and individuals who are active with birds of prey, as well as military personnel. The show hosts almost always bring out a few of the animal performers for an up close encounter." It's only natural to wonder just how safe you really are at any show that includes wild animal performers. Are you taking a risk by attending? Stockdale can only speak for his own show, but he says he has never had a guest injured by a bird. "We always tell our audiences that our birds are very well trained, but they're not potty trained. So, if a bird were to fly up into the rafters, you may want to cover your head momentarily with your park map until the bird flies back to the stage. That's about as dangerous as it gets! Of course, we have safety procedures in place to help us recover a bird if one ever happens to leave the show area." Of all the insider tips Dan Stockdale offers for getting the most out of your show experience, his final tip might just be the most useful one of all. "See the show twice. Watch it once for the pure entertainment value of the show, and then come back at another time ready to take pictures. Watching every bird, from the tiny screech owl to the majestic bald eagle, is an amazing experience." Although many of these tips pertain particularly to the Wings of America show, you can still make use of them at nearly any animal show you attend. You just have to take the opportunities that present themselves to approach the trainers and ask questions. The worst that can happen is that they may say no to some of your requests. On the upside, you could wind up in the next show. Just imagine how awesome that would be.